On October 19, 2017 astronomer Robert Weryk discovered an object passing by the sun, and it was determined that it had experienced repeated episodes of non-gravitational acceleration. The object, named ‘Oumuamua (meaning ‘messenger from afar arriving first’ in Hawaiian), is considered the first interstellar traveler we’ve detected passing through our solar system at an incredible speed, but no one knows exactly what it is or where it came from. Well, Harvard astronomer Avi Loeb thinks he knows and suggested this object may be an alien spacecraft with a light sail sent on a reconnaissance mission, and that no one should blindly dismiss his idea because “That is a prejudice that we shouldn’t have.” Instead, we should be open-minded, he suggests. But why would any rational scientist think this? According to Penn State Astronomer Jason Wright, “I can’t figure this thing out and that’s why it’s so interesting, so cool- it just doesn’t seem to make sense.” Ok, so, because it doesn’t make sense, it’s gotta be aliens! Right. The funny thing is that these claims are taken very seriously by some. In this case scientists actually suggested these ‘megastructures’ were big solar panels placed around the star to collect energy. Of course, there are plenty of natural explanations for the observed phenomena- such as debris from comets, but some people do believe in aliens, and any anomaly is enough to spark the imagination. As for Oumuamua, it has been classified as both an asteroid or a comet at one time or another, then considered neither an asteroid or comet, and now it’s thought to be an asteroid again. Nonetheless we can reasonably conclude that it originated outside our solar system because it has the same reddish hue as objects outside our solar system, and it’s traveling at such a high rate of speed that it can’t be captured in solar orbit. There are no radio emissions or other signals coming from it; it’s thought to be up to a half mile long, extremely elongated, tumbling through space, and scientists have concluded that the acceleration is due to jets of gasses escaping the object as it races through space. 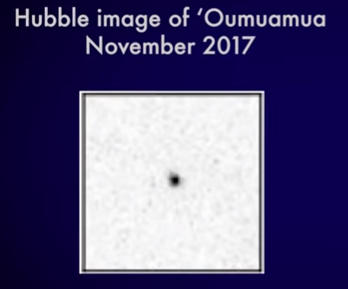 I think it’s far more reasonable to conclude that both Oumuamua and Boyajian’s star are natural phenomena and not alien in nature, and as we gather more information, we can make better assessments. There is no scientific evidence for alien life, except for evolutionary speculation and conjecture. We don’t need to resort to aliens whenever something doesn’t make sense. Doing so halts scientific progress because it stops further research and inquiry. Instead, we should continue researching to find the answers to our questions. Aliens are never the answer.